But does it provide that perfect blend of discovery, combat, philosophy and cheap humour that characterised Star Trek at its strongest? Can it submerge us the suffocating moral ambiguity of Deep Space Nine, inspire us like The Next Generation, or make us squee with dread like the tribbles of The Original Series? 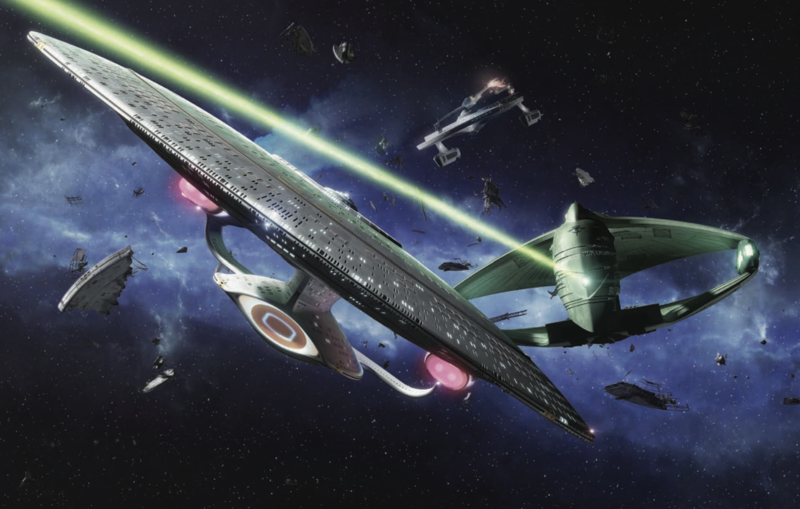 Does it boldly go where no science fiction RPG has gone before? For the past two months I’ve been exploring strange new worlds with the crew of the USS Mulligan. We’ve encountered new life and new civilizations, exchanged searing phaser fire with the cruel Cardassians, shattered the prime directive and even had some touchingly awkward spy-versus-spy moments in the ship’s conference room. In other words, we’ve been enjoying a good old-fashioned Star Trek time, though without the need any custom dice or that massive Borg cube below, packed as it is with maps and minis. 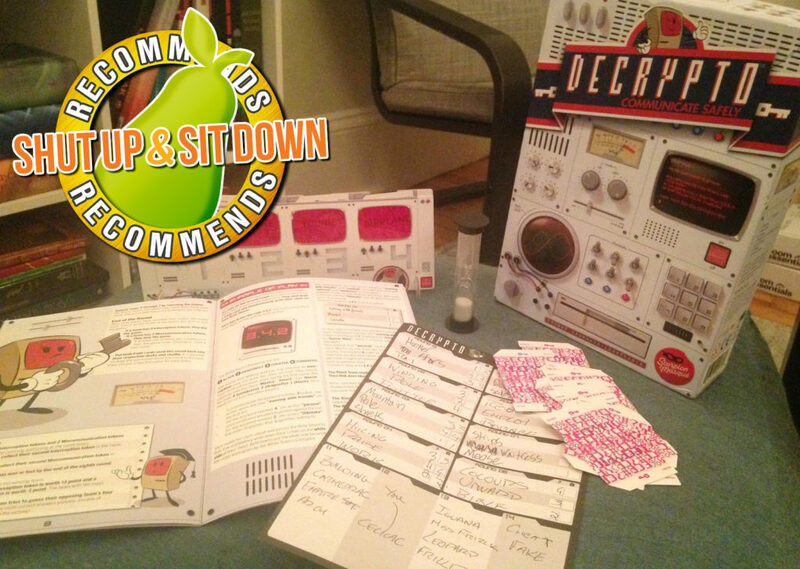 Just a .pdf rulebook, a hodgepodge of d6s and d20s, plus OUR OWN BEAUTIFUL IMAGINATIONS. I’m ashamed to have forgotten it, but this game has reminded me that the suspense from rolling dice can be such a visceral thrill. Adapted by Nathan Dowdell from a design by Jay Little (responsible for the infamous X-Wing), the system is simpler, faster, and more forgiving than Dungeons & Dragons. Instead of one d20, you always roll at least two because difficulty is metered by the number of successes. Beaming up Leonard Nimoy in good space weather takes one success, beaming him out of the Gamma Quadrant would take five. Need more dice? Look to your fellow crew members or even your ship for assistance, or spend some Momentum, which you earn whenever you roll more successes than you need. Momentum can also be used to dodge injuries, take extra actions, or deal damage beyond whatever the six-sided Challenge Dice have declared. It’s all delightfully fast and works so well that I never have to worry about the action stalling because of failed rolls. 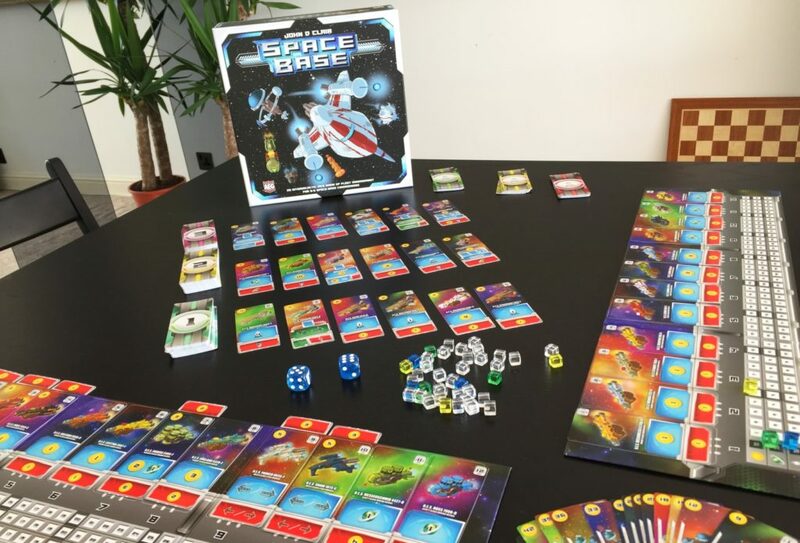 Players tend to slowly accumulate Momentum and then frantically dump it all when things get really… dicey, so there’s this brilliantly varied pace within scenes and nobody burns through their resources too early. The GM has a mirror resource, Threat, limiting how cruel you can be to the players at any given time, or helping you to be absolutely brutal at the most perfect moment. Character creation is wonderfully open, closer to Tales from the Loop than Dungeons & Dragons. Species (yes, you can play a Klingon) shape your abilities without boxing you in, while nothing stops an engineer from knowing field medicine or a captain trying martial arts. You create your own foci, anything from xenobiology or interrogation or transporters, to gambling, Bajoran religion and baseball. Whenever relevant, these foci double a success result and they make a regular, major impact on the game, unlike the throwaway choice of your favorite 80s number in Tales from the Loop. You also create your character’s Values, such as “there’s no such thing as a no-win situation” or “threw out the handbook and wrote my own.” Adhering to these or suddenly turning your back on one can give you control over a game-changing dice roll in a desperate situation. 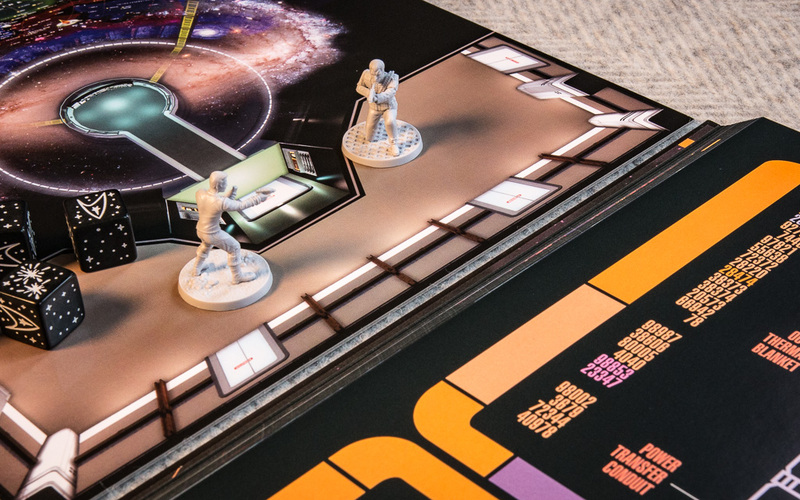 I love all this because it lets you have the Star Trek crewmembers your nerdy heart has longed for: adventure heroes like Kirk and Spock, sitcom characters like Troi and Data, or multifaceted people like Kira and Sisko. They’re all able to genuinely grow as personalities beyond the pedestrian routine of levelling up and gaining new talents, even shifting their ideologies over time. But. BUT. The Attributes and Disciplines, the character nuts and bolts that matter for every roll, aren’t quite right. To beam up Spock without splinching him, for instance, you need to roll under the sum of your character’s Control plus Engineering, which could be as low as 8 or as high as 15. That one’s crystal clear: the player knows what to roll, the GM what to ask for. To get an alien being to trust you, however, you must roll…. Control plus Command? Surely not Presence plus Conn? Would bluffing in a poker game be Presence plus Command? Or is it Daring plus Command? What does a changeling roll to hold human shape under stress? What do you roll to interpret “Darmok and Jalad at Tanagra“? What do you use Conn for, anyway, beyond piloting the ship? What does anyone add together ever to roll basic perception? These bother me because, unlike the rest of the game, these twelve categories seem to be fast and loose, lacking the interpersonal complexities (and absurdities) that that wormed Star Trek so deep into my heart. At some point I am going to cross them all out and homebrew my own, but this is the only thing I’d change. The only thing. Is the game still playable? Oh yeah. Do I recommend it? Oh yes. And I haven’t even told you about all the most remarkable embellishments on the icing of this dessert. Like how you handle the massive crew of a starship as, after all, Picard’s Enterprise was home to over a thousand people. 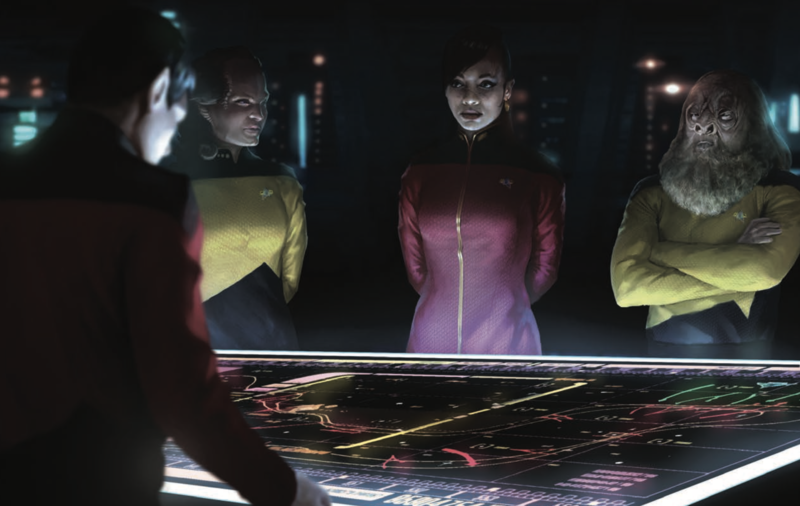 Star Trek Adventures has the GM and the players manage the supporting crew together, so that the GM doesn’t suddenly have to voice three different replaceable redshirts in a scene focused on one player. Any players not present in that scene can create, play, or even carry on shaping those roles. Then, there’s the mechanics of the ships themselves. Basically, your USS Enterprise or Defiant or Hamilton or whatever stays in the background most of the time, assisting characters whenever it would make sense. Ship stats echo character statistics, so they’re easy to understand, and while ship-to-ship combat involves a few different options and actions, it works basically the same way as character-to-character combat, so that you can remain focused on the actions of the people involved. Then there’s the support Modiphius is giving to this game in the form of its living campaign, where they’ll periodically toss free adventures into your inbox. Even if you never play them, you can still mine them for setting details, NPCs and plot hooks. 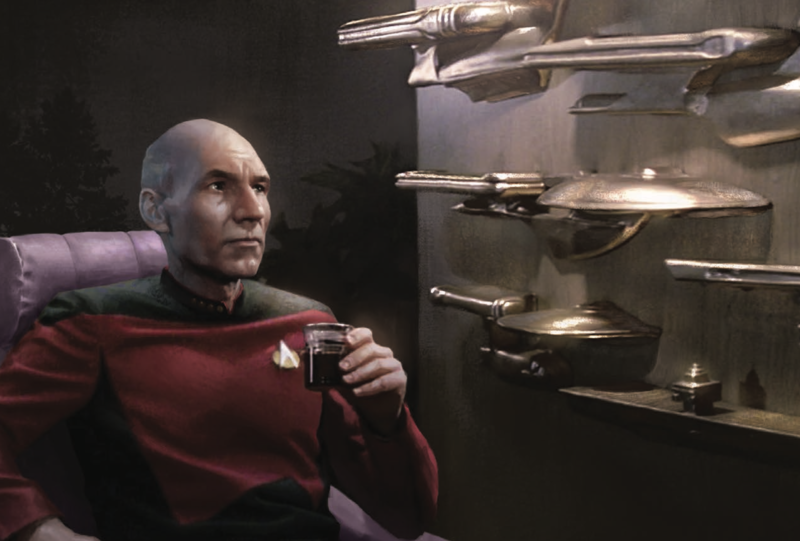 The living campaign also suggests that Modiphius intends to devote energy to Star Trek Adventures for years to come, which potentially means juicy convention events and perhaps organized play festivities. 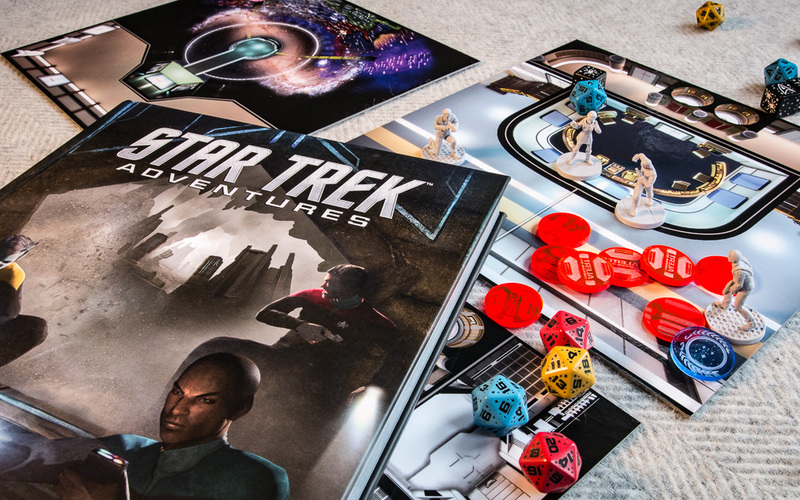 In fact, partially because of how good the pre-written adventures have been, the pastel-iced layer cake that is Star Trek Adventures has risen to the top of my “Which RPG Do I Start With” list. It’s pretty much ideal for a novice player or GM. 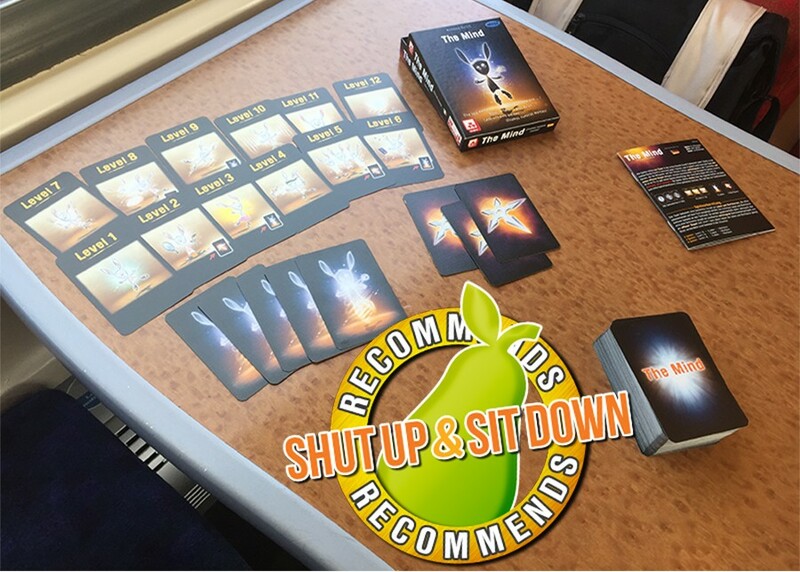 It’s got non-threatening dice mechanics, entertaining and open-ended character creation, a well-crafted intro adventure in the core rulebook, free content, a narrative structure that encourages both player and character collaboration, even a science-fiction universe that you can learn all about from Netflix. 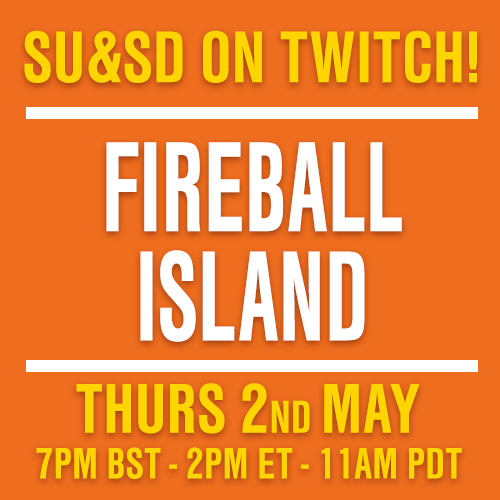 Seriously, before you try something as rules-light as Lady Blackbird, even before venturing into Dungeons & Dragons, start here. Whether you like Star Trek or not. It’s that good. 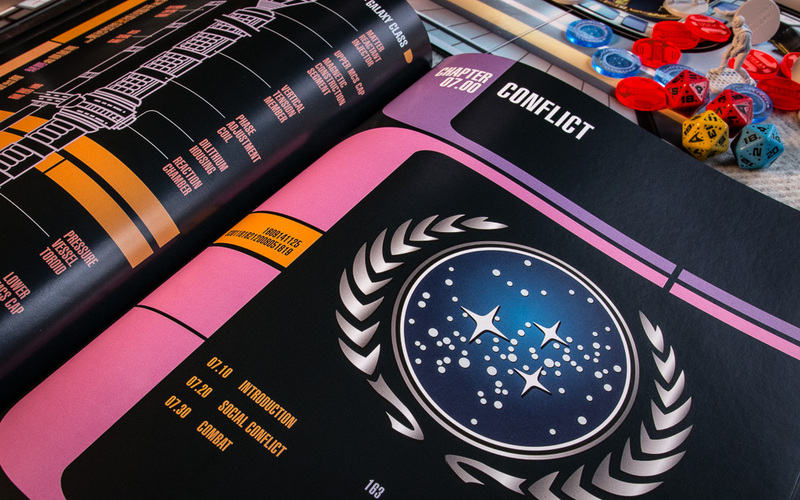 For my fellow trekkies, however, a few setting specifics: Yes, the core rulebook focuses on The Next Generation/Deep Space Nine era, but it does also support The Original Series and distant excursions in the style of Voyager. Yes, there are technical details about warp and impulse engines that I read but don’t understand, and which you can either nerd out over and use, or just plain ignore. 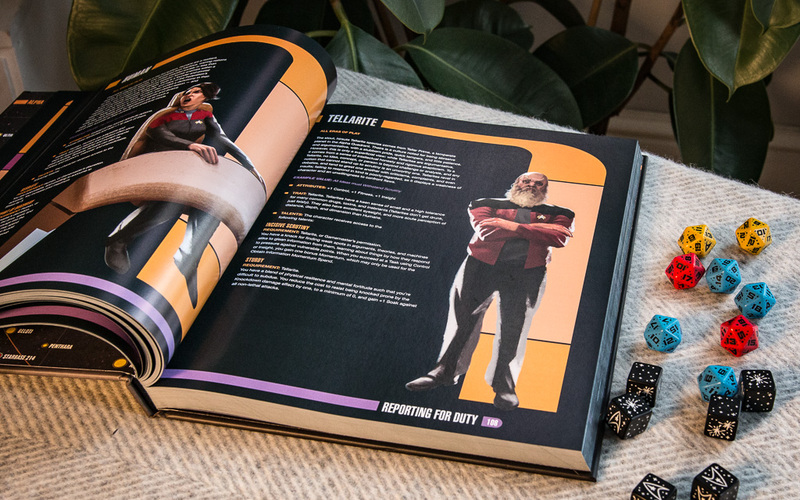 No, you can’t actually play a Changeling or Q (no one should EVER play Q) and no, there aren’t detailed rules for holodecks or the mirror universe and all its evil beards. Content yourselves with one fictional reality at a time. 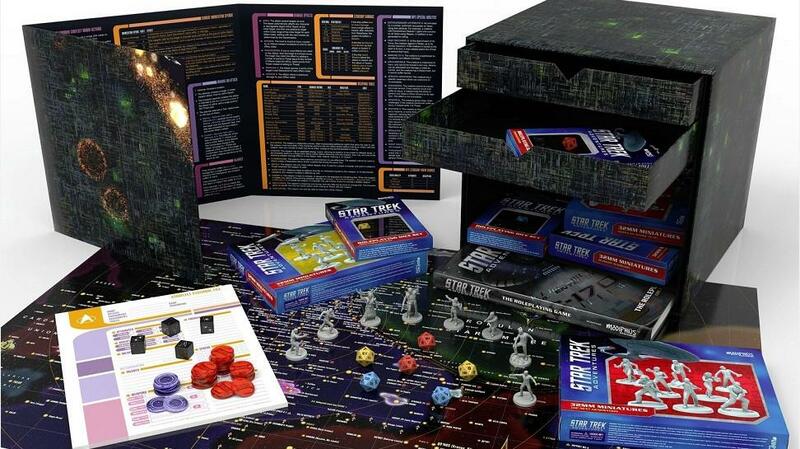 I think you’ll all be very happy with Star Trek Adventures, but you don’t have to take my word for it. 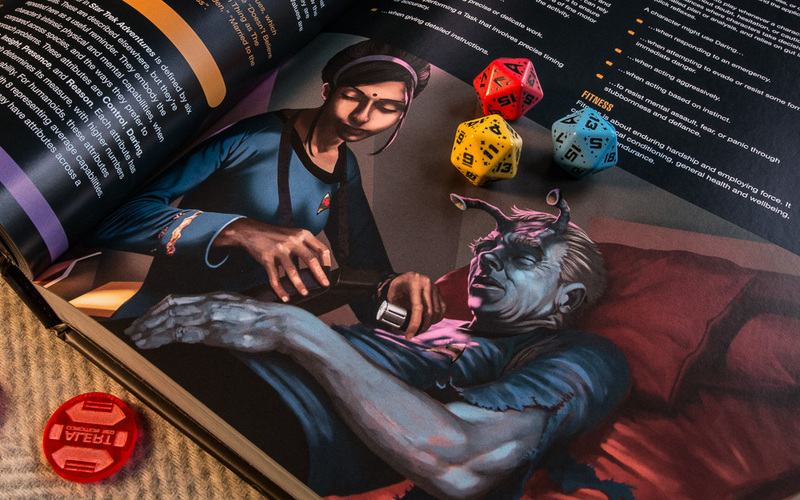 Brew some Earl Grey or some Romulan Ale* and download the free Quick Start Guide before you commit to getting a core rulebook or a gigantic Borg cube. Have your free cake and play it. *Actually do NOT drink Romulan Ale unless you want a hangover that lasts two days. This is a well documented and scientifically proven fact. Though, idk, maybe its fine if you’re actually Romulan. 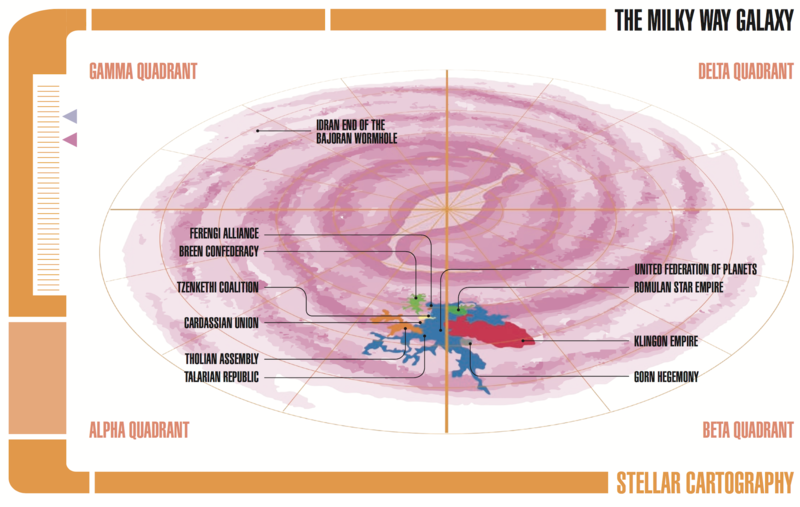 Do we have any Romulan readers?